2T - $48.99 Only 3 left! 3T/4T - $48.99 Only 4 left! Pugs are quite the paradox. That pudgy little nose and those weird bulbous eyes should disqualify them from the category of cuteness quite unequivocally. Yet, somehow, they might be the most adorable thing on the planet. The way the hobble around on those short little legs just makes you want to scoop them up and hug them for an eternity. The way that little curly tail squiggles around like a spring makes you go, “aww!” and when those giant eyes gaze into your soul, well it might almost bring you to tears of joy. Those little pooches are one meme away from ruling the Earth, so it’s no surprise that your little one is totally obsessed with the Disney Junior show, Puppy Dog Pals. Bingo and Rolly are always getting into some grand adventure, while hilarious antics ensue. Now, you and your child can have some crazy adventures and get into some hilarious antics when you dress your little one up in this Puppy Dog Pals Bingo costume. That’s right! This Puppy Dog Pals Bingo costume is an adorable toddler-sized outfit that transforms your child into the cutest little pup in the neighborhood. 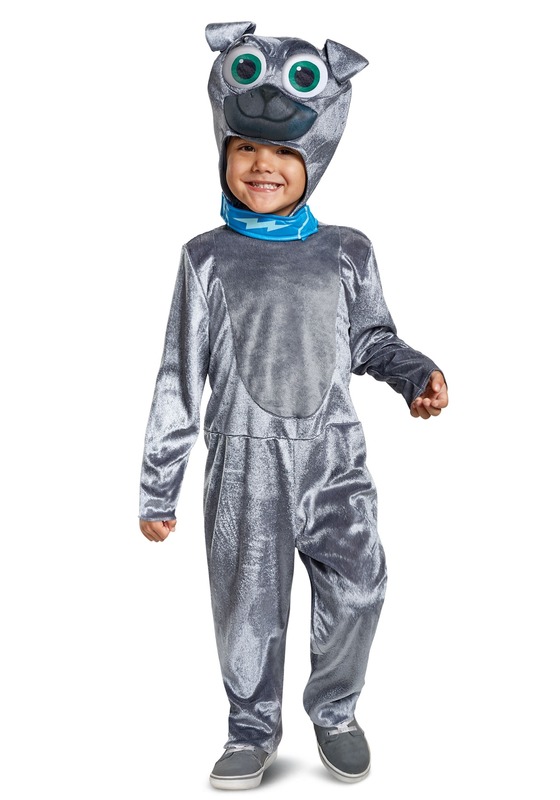 The officially licensed toddler costume comes with a soft, gray jumpsuit. The included headpiece is designed to look like Bingo’s face, including his big green puppy dog eyes and his dark gray snout. It also has his bolt-emblem collar that fits around your child’s neck. To top it all off, a pair of cute puppy ears are on the top of the headpiece! Of course, the Puppy Dog Pals are only in full motion when they’re together! You may just want get one of your toddler’s friends to dress up as Rolly to unite the adventurous duo of Disney pups.